Ireland - rain, Guinness, pubs, rain, drinking, Dublin, cliffs of Moher and... more rain. This is probably what most of visitors think about this green island. However, when you are lucky enough to hit the jackpot and come across a few sunny days in the summer, you'll be so surprised! 15 minutes on the train from the dull capital - Dublin (yes, it's not too beautiful, but the locals are one of the friendliest in the world) and you can admire the cliffs, beaches, mountains and... subtropical flora! Palm trees, eucalyptus, cedar and rhododendron trees together with stunning sea views - feels more like at the Mediterranean sea rather than so far north. Ireland boasts some of the beaches reminding those in tropical areas - with clear, turquoise waters and incredible fauna - in Skellig you can walk among thousands of wild puffins that seem to pose for photographs! Ireland is best known for spectacular cliffs, endless green meadows, hundreds of sheep, ubiquitous pubs and of course, above all - Guinness. A beach is something that never comes to mind when you think about things to see in the Emerald Island. However, it’s good to know some nice place where you can relax and enjoy your time when the sun actually appears and chases away the gray cloud cover. During such a rare event, when you visit Dublin, you'll probably notice the masses escaping to Howth, Bray or the city beaches such as Portmarnock. They are all nice locations, however there are no sandy beaches in Howth and Bray and the ones in the north of the capital are long and endless with unimaginable crowds and murky water. But what if we told you that we discovered a hidden little beach that is mostly known only among locals and it’s not worse than the beaches surrounded by cliffs in countries like Portugal? How to Get to Skellig Islands - "Irish Machu Picchu"
Although Skellig Islands may be the most impressive attraction in Ireland, only few know about their existence. While places like the Cliffs of Moher or the Ring of Kerry are known world-wide, Skellig islands remain in the shadow of the most popular sites in Ireland. For me, Skellig is probably the best of all I've seen in Ireland. This tiny speck of land combines all you need for a perfect tourist destination into one: spectacular scenery, amazing wildlife with multiple sea birds and historical, unique, beehive-like monastery. So why is this magnificent site virtually unknown and less popular than, say, the Cliffs of Moher? Ring of Kerry is a nearly 200 km (125 mile) long loop route in county Kerry among Ireland's most stunning landscapes - little, cozy villages, green hills and fields, castles, bare mountains and hundreds of lakes in Killarney National Park. Moreover, along the Atlantic Coast, as a part of "Wild Atlantic Way" - you can enjoy breathtaking views over dramatic cliffs, sandy beaches with surprisingly clear blue water and amazing and off the beaten path Skellig Islands (sometimes called Irish Machu Picchu) which are the home for thousands of colorful puffins that seemingly love to pose for photographs. Most of what Ireland is famous for can be seen concentrated within this little piece of land. Cork, with the population of only around 120,000 is the second largest city in The Republic of Ireland. It's a perfect destination for a few days, short break from Dublin, especially in the summer when the weather is better and the blue skies emphasize the clear waters of the beautiful coastline in the south of the Emerald Island. You will be surprised how many hidden, spectacular cliffs, beaches and coves the area can boast. The countryside is absolutely stunning, perfectly lush green, with little villages dotted here and there. On a sunny day you might get the impression that you are in a way more exotic place than Ireland! Achill Island, Ireland's largest island lies in the western part of the country, in County Mayo. It's not far from Connemara, quite famous and beautiful National Park and 200 km (125 miles) north from the most popular attraction of the Emerald Island - Cliffs of Moher. Achill Island has a lot to offer: the natural beauty with beautiful coast, imposing mountainous peaks and, in my opinion, the most spectacular sandy beach in Ireland - Keem Bay. However, surprisingly, for some reason, (just like the magnificent Skellig Islands and Benbulben Mountain) Achill Island is virtually unknown to visitors. It's usually omitted in the tourist guides about Ireland and there are no tours available from Dublin (although the tours include the nearby Connemara). I found out about it by coincidence while browsing photos on google maps and decided it's a place well worth visiting! I wasn't wrong! For me, Achill Island was definitely one if the most spectacular spots not only in Ireland! Powerscourt Waterfall may not be the largest or the highest waterfall in the world, but together with the breathtaking natural surroundings and Wicklow Mountains in the background, it creates one of the most spectacular scenery in Ireland. 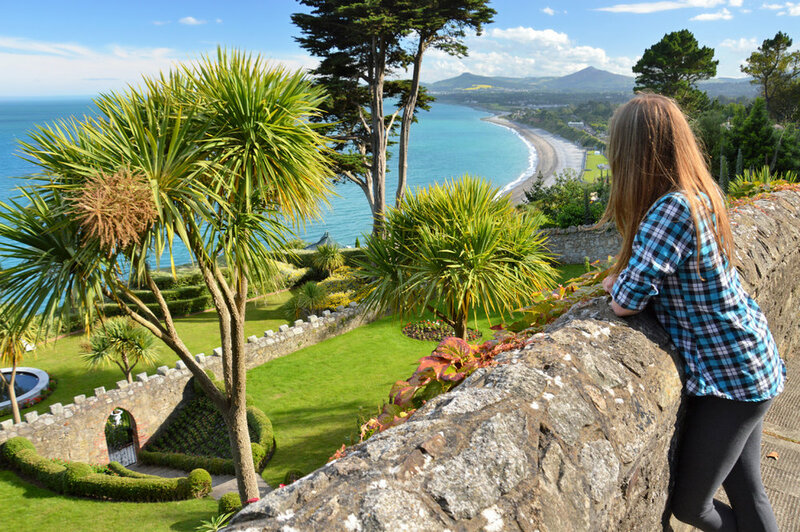 Located near the picturesque village of Enniskerry and the famous Powerscourt Gardens, it attracts many visitors, especially during summer weekends. However, if you wish to venture into the wild, there is a beautiful trail in the mountains that will even allow you to see the waterfall itself from a bird's eye view. The Howth Peninsula - located north from Dublin Bay is yet another place (besides the southern towns of Bray, Greystones, Dun Laoghaire and Dalkey) on the beautiful Dublin coast to visit while staying in the Irish capital. As I mentioned in the previous posts, the nature around Dublin is striking and also very easily accessible by public transport. Within minutes you can travel from a busy, crowded and somehow grey city to the mountainous seaside full of coastal trails running along magnificent rocky cliffs. As I mentioned in one of the previous articles, one of the greatest things about Dublin, the Irish capital is how close it is to the beautiful coastal areas where the mountains and rugged cliffs meet the sea. Within only around 30 minutes by train from Dublin you can reach either the northern or southern parts of the coast. Especially beautiful in the summer, it has this sub-tropical touch provided by a wide variety of Mediterranean and exotic for this latitude plants, like Cedar trees or even palm trees. So don't miss it when you are in Dublin, you will be nicely surprised! When you are visiting Dublin in summer, it's great to get away from the grayish capital to the beautiful coastal areas, especially because they are so close and at the price of only 5 EUR (7 USD) for a return ticket, using public transport, you can admire the beautiful nature that surrounds the city. You will be surprised. Powescourt Estate with the impressive castle that dates as far back as the thirteenth century and the 19 hectare gardens are one of the greatest tourist attractions of Dublin area. The estate is located among beautiful Wicklow Mountains scenery and offers breathtaking views of the distinctive Sugar Loaf peak. Very close to Dublin city, around 45 minutes drive from the center, it's a perfect place to enjoy a weekend, especially in the summer time when all the trees are lush green and all flowers in blossom. The name "Glendalough" means "the glen of two lakes" in the Irish language. The valley is located only around 50 kilometers (30 miles) from the Irish capital city - Dublin. It's very easily accessible, only one hour drive and it's a perfect place for a weekend or even one-day escape from the city crowds. The ruins of the ancient monastic city, two magnificent lakes surrounded by cliffs and rocks, nearby forests as well as waterfalls create an unforgettable scenery. There are many trails available for visitors in the area. Hiking one of them is not too difficult, there are many observation points that offer a spectacular view over the whole valley, lakes and the monastic city. If you don't know where to go on a sunny day in Dublin, Howth Rhododendron Gardens can be a great alternative to the crowded city parks. In contrast to the very popular center of Howth village, which when the weather is good, attracts many people looking for an escape from the busy capital, Rhododendron Gardens are relatively a little known, peaceful and relaxing place, ideal for hiking, picnics, enjoying the beauty of nature as well as admiring spectacular views of the peninsula, and you can be sure you won't meet crowds of people there, even during the long summer days. Known by few, Benbulben Mountain (also spelled Benbulbin or Ben Bulben, from Irish "Binn Ghulbain") can be a great alternative weekend destination from the Irish capital, Dublin. Not crowded with many tourists and not difficult to climb from the south side, offers amazing views from the top over the Sligo town, the coast and the sea. Ben Bulben, at the elevation of 526 meters (1727 ft.) above sea level, is in fact a part of the Dartry range and its distinctive, table mountain-like shape was formed by moving glaciers during the Ice Age.